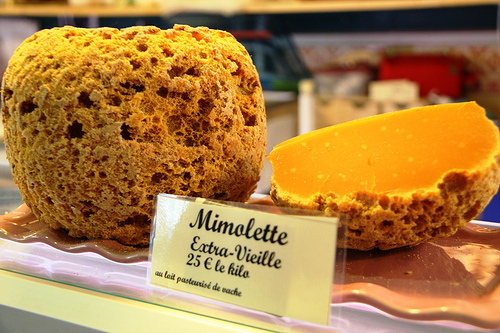 American fans of the famed French cheese Mimolette are mite-y pissed off that U.S. Food and Drug Administration (FDA) has temporarily banned the favorite cheese of Charles de Gaulle. Due to concerns that the mites (which produce the distinctive gray pocked crust) could potentially cause allergies, over a half ton of the hard stuff now languishes in a cheese jail in New Jersey. So glad the FDA has finally caught on to the dangerous mites that have been a natural and integral part of the Mimolette cheesemaking process since the 1600s. If you’ve been missing the cheese that most closely resembles a cantaloupe, you too can protest this decision at the Facebook page: https://www.facebook.com/SaveTheMimolette.